Surfacing today via a tweet sent out by journalist @Riciolo1, is the retail packaging that will be employed by Sony for its limited edition Sony Xperia Z5 Compact Spectre model. Spectre is the name of the next James Bond movie. 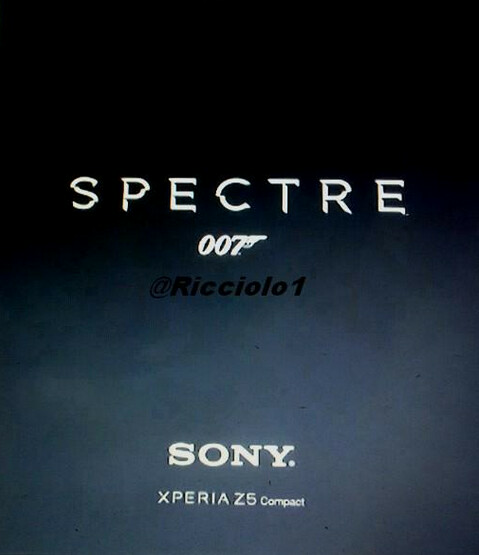 Back in July, Sony was already teasing a promotion between the Bond series, and an Xperia handset. With Sony's Columbia Pictures division distributing Spectre, a partnership between Sony's new top-shelf smartphone line and the U.K.'s best (albeit fictional) spy could be expected. Just a couple of weeks ago, we showed you a new ad that Sony developed for the Xperia Z5. Using the Miss Moneypenny character from the Bond films, the commercial follows M's private secretary as she goes on an urgent errand to pick up 007's new Xperia Z5 and deliver it to him. That ad starts running on U.K. television tomorrow. The Sony Xperia Z5 Compact features a 4.6-inch screen with a 720 x 1280 resolution. Pixel density? Glad you asked. It works out to 319ppi. The Snapdragon 810 chipset is under the hood, carrying an octa-core 2GHz CPU and the Adreno 430 GPU. 2GB of RAM is inside, along with 32GB of native storage, of which 23GB is available to the user, and is expandable. A 23MP rear-facing camera is on board along with a 5MP front-facing shooter for selfies and video chats. The power is provided by a 2700mAh battery, and Android 5.1 is pre-installed. The IP68 certification means that the Xperia Z5 Compact is protected against dust and water. We would imagine that the limited edition Xperia Z5 Compact model will contain special James Bond content. As far as pricing and availability go, right now that information appears to be classified as a manufacturer's secret. It's going to be a beast with 720p and using sd 810. If you want to follow z5c reviews, just check btekt and adrianisen's youtube videos. Adrianisen have been very active uploading reviews on his newly bought z5c even pitting it against iphone 6. I can only guess that something like this is going to run around $399-$450? This gonna make the iphone 6S look like a budget chinese phone.. Bring it Sony. The Compact series has been a cracker so far. Keep up the good work!! Hmm wonder if Bond will rock that Xperia Z5 or Z5 Compact. He only use in the movie 007 because Sony is a partner into this movie production but in real life, his using Apple iPhone. Still never seen a Sony phone in the wild. Are they real? I want to see the difference between the regular Z5C and Made for Bond Z3C. Full HD! ?